So most of you know I am a proud Canadian, born and raised. Just recently, about 3 years ago recieved my Dutch passport because of my mom being born and raised in the Netherlands. 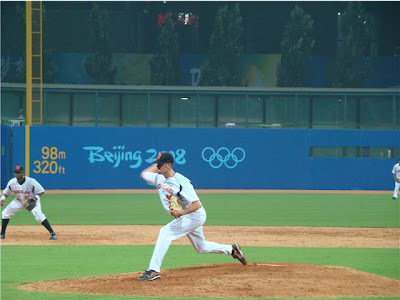 Well, yesterday was the second time I've been on the team while we played team Canada, and marked my first time pitching against them. 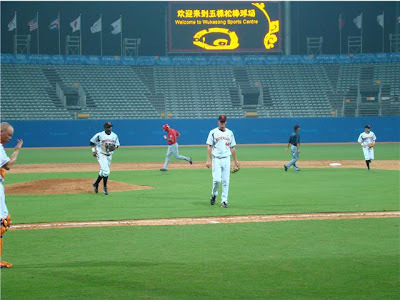 We played them on the best feild that Beijing has to offer, the #1 Olympic feild, and it was beautiful. 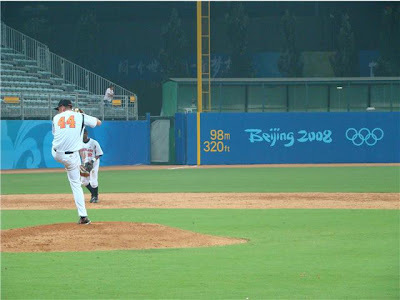 An amazing feild, and it got to see a good game, even though it was exhibition. It was a 7 inning game, and I came in to close the game out in the last inning, 3 up 3 down with a strikeout on the first guy. We tied 1 to 1, in a very evenly matched game. We both used several pitchers, our starter going 3, and 3 relievers including myself going the last 4 innings. We play them again today at 2 pm, but it has been raining a bit through periods this morning, so we're hoping that holds off long enough to play a full 9 inning game today back at Wukesong stadium. Time to beat them damn canucks... you wouldn't believe how many of my teammates are poking fun and saying "eh" now... I'm turning them all into Canadians, slowly but surely.